Secret lives, scandalous turns, and some very funny surprises — these essays by leading kids’ lit bloggers take us behind the scenes of many much-loved children’s books. Told in lively and affectionate prose, this treasure trove of information for a student, librarian, parent, or anyone wondering about the post–Harry Potter children’s book biz brings contemporary illumination to the warm-and-fuzzy bunny world we think we know. Betsy Bird is the youth materials collections specialist for the New York Public Library and the author of Giant Dance Party, illustrated by Brandon Dorman. In addition to writing for The Horn Book magazine, she is the creator of the blog A Fuse #8 Production. Julie Danielson is a regular contributor to Kirkus Reviews, and in her blog, Seven Impossible Things Before Breakfast, she has featured and/or interviewed hundreds of top names in picture books. Julie Danielson lives in Tennessee. Peter D. Sieruta (1958–2012) was an author, book critic, and frequent reviewer for The Horn Book magazine. His blog, Collecting Children’s Books, served as inspiration for his contributions to Wild Things! The collaborators plow an ample field, and they do so with affection, insight, the occasional raised eyebrow, and great good humor. Theirs is a book that will delight and divert any lover of books for kids and will also inform newcomers to the field, planting seeds of salutary subversion in their minds and hearts. Wild Things!, I think I love you. Three popular kidlit bloggers take readers on a wild ride through children’s literature that is as entertaining as it is educational. Like the tone of their respective blogs, the writing style is breezy and conversational. Fans and students of children’s literature will learn a lot, be entertained, and come away with interesting trivia and anecdotes. ... The authors do a fine job of debunking the notion that children’s literature is all “fuzzy bunnies” and “pots of honey.” ... The authors’ knowledge shines through and with its extensive source notes and a thorough index, this title is not to be missed. A perfect choice for children’s literature courses. The authors’ enthusiasm and engagement will keep the pages turning. [F]ascinating... The discussion of censorship is particularly thoughtful, both emphasizing intellectual freedom and considering the problematic nature of classic literature amid changing cultural sensibilities. ... [A] whole lot of enjoyment and no small amount of edification. Three children’s book specialists gleefully shred the “romanticized image” of children’s authors, illustrators, and editors, slinging behind-the-scenes lore, recalling censorship controversies, and profiling innovators like Maurice Sendak, Ursula Nordstrom, Roald Dahl, and others who eschew cutesiness. ... This chatty volume sheds light on children’s literature’s household names. A lively historical survey of scandals and secrets from the children’s-book biz... [T]he gossip is good (and scrupulously documented); sandwiched among the juicy bits are thoughtful passages about censorship, celebrity books, and the perpetual struggle between the reading tastes of children and what their elders prefer for them. Memorize every word of this brilliant book, then quote it at cocktail parties and watch as knees buckle beneath your erudite greatness. I was afraid this book might be one of those eat-your-vegetables, musty history lessons. To my delight it skipped the vegetables entirely and went straight for delicious and dangerous desserts. I ate it up in one sitting. For anyone who thought children’s books and their creators were all sugar and spice, fasten your seat belt and get ready for an unexpected joyride through the genre! Wild Things! pulls back a rose-colored curtain to expose the real deal behind bunnies, banned books, and how ‘the next big thing’ is built. Wow, what an interesting group we creators of children’s books are! Of course, we’ve known this all along, but because of Betsy Bird, Julie Danielson, and Peter Sieruta, the rest of the world can know, too. What a great book! I literally couldn’t put it down. With tales of banned bunnies, drunken ducks, and gay penguins, "Wild Things!" leads the battle against the ignorance, half-truths, and just plain foolishness that afflict so much writing about children’s literature. Punchy, lively, and carefully researched, the book is a must-read for anyone interested in books for the young. So. Stop reading this blurb, and buy the book. —Philip Nel, co-editor of "Tales for Little Rebels: A Collection of Radical Children’s Literature"
In its jolly mission to expose the dark underbelly of the children’s book world, "Wild Things!" turns up stories I’ve been hearing noised about for ages, but with a lot more detail and authenticity. The stories may not be quite as sordid as my own imagination had conjured up—although a few of them are—because there’s no denying that this field is full of mostly nice people!—but it’s all fun and a great read for anyone interested in both children’s books and the collection of people who make them. I’m a sucker for stories about the makers and makings of great children’s books, and "Wild Things!" is full of tales that are vivid, rich, and the good kind of gossipy. 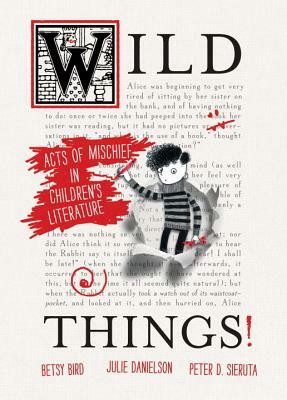 If you know anything about children’s books or nothing about children’s books, Wild Things! is for you. It is the real deal. Read it now. It will make you smarter. And you will never look at fuzzy bunnies the same way ever again. A frisky safari through the wilderness of children’s literature. . . . The narration is deft, detailed, and wide-ranging. Open this secret door that children’s literature warns us against and you’re in for a walk on the wild side, not to mention a pie in the face — in fact, on almost every page, a pie in the face. This book is a mischievous, risky, highly amusing, disturbing, and informative romp. I say, suppress it.